[…] I found a representation of the Moche mural in a scholarly journal, the camphorous rosin that lifted from the pages a world away from the clean mineral tang of desert where the real-life mural crumbled out of anyone’s sight. I saw that my friend’s ‘machines’ were in fact weapons and military regalia, and that they attacked warriors, their owners. Weapons weren’t exactly cooking utensils, but still, both were important tools, and in both imaginings they had come to life to rise against humans. How could the imaginations of the Andean and Moche civilisations, distant across time and space, be so connected? Connections have also been drawn even further afield, with the Mayas and their Popol Vuh. There it is written that early humans were spoken to by their maize grinders, cooking griddles, plates, pots and grinding stones, which, in revenge for the way humans had treated them, crushed their owners’ faces, ground up their flesh, landed on their heads and flattened their bodies. The correspondences across time and space suggest that this Revolt of the Objects, as it is usually called, is an ancient American myth. I contemplated the reproduction of the Moche mural: headdresses, clubs and weapons sprouted arms and legs and chased after people, attacked them and dragged them by their hair. Chaos reigned on the walls as humans were domesticated by the tools they had created: one man grimaced in pain, another stumbled as a shield attacked him. The militaristic Moche were thrust to the bottom of the food chain by the technologies responsible for their regional dominance – their most important tools – just as the Huarochirí informants and the Maya had imagined their ancestors were. I closed the book and leaned back in my chair. The neon lights were casting a clinical sheen across the desk and there were murmurs drifting from the stacks. Sometimes a piece of the past flies through time at just the right angle to cast new light on the present. Images from a steady diet of pop-culture rose in my mind: cool, terrifying robots, humans in farms and the planet a wasteland. It seemed that the modern, Western imagination to which I was subject wasn’t so different from this ancient American one. Tools: they have long been recognised as our evolutionary ally, yet we humans are not actually alone in our fashioning and making use of them. To name just a few other animals that do the same, chimpanzees have a toolkit for termite hunting that includes a short stick to penetrate aboveground mounds, a large stick to drill holes into subterranean nests and a probe that they first pull through their teeth to craft a frayed end, all the better for collecting the insects. Bottle-nosed dolphins, to protect from abrasions as they search for food on the seafloor, tear off pieces of sponge and manoeuvre these around their snouts. And elephants, once they have dug a water hole, rip bark from a tree, chew it into a circular shape and then place it over the hole to limit evaporation. The difference between tool use among humans and these other animals is, of course, in the tools’ comparative level of complexity. Around 2.6 million years ago, hominids of the Homo genus first reached the level of tool use of modern-day chimpanzees, elephants and dolphins; in their case, they used hunks of rock for pounding and sharp flakes for cutting through hide. It wasn’t until 1.8 million years ago and the appearance of Homo erectus that our ancestors, through their fashioning of axes and cleavers, became more technologically advanced than other species in any time period. More tools followed. Four hundred thousand years ago came spears; two hundred thousand years ago came glue; twenty-eight thousand years ago came rope. In the fourth millennium BCE appeared the wheel; in the second century BCE, paper; in the ninth century CE, gunpowder. If I were to keep on in this way, listing chronologically our most significant tools and the dates on which they were invented, the diversity of these would increase and the distance between dates would diminish until we arrived at the explosion of tools that is the present. It is perhaps not surprising, then, that we Homo sapiens sapiens have not only evolved as a result of tools – we have been shaped by them. We have lost our sharp fingernails and our heavy jaw musculature. Our eyesight is worse nowadays than it was ten thousand years ago. Over the past thirty thousand years our brains have decreased in size. All of these apparent signs of devolution point to one indisputable fact: we have become a species conditioned to use tools. In other words, children told to get off the computer and go play outside are, contrary to what well-meaning parents believe, actually doing the opposite of what has become natural. 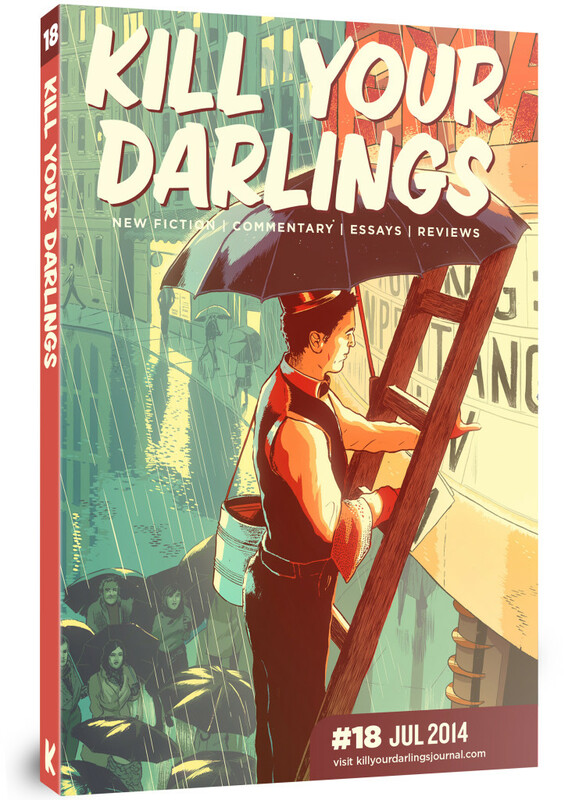 Read the rest of this essay by purchasing the issue at Kill Your Darlings.